It’s a biographical museum dedicated to the most famous and eminent inhabitant of Torun. The museum is located in two beautiful tenements from the Gothic period, vis-à-vis our hotel. One of the most beautiful late Baroque granaries. Built at the beginning of the 17th century. Its window casings resemble bags with grains. This St. John’s Cathedral is a proud Gothic castle – the oldest one in Torun, dominating the whole city. A monument from 1853, being one of the earliest ones depicting Nicolaus Copernicus in Poland and worldwide alike. Erected barely 160 years ago, yet seems to have been entwined with the city for ages. The ruins of the Teutonic Castle in Torun remind us about the first and simultaneously oldest stronghold of this order on the Chełmno Lands. It’s a former town keep, leaning due to the clayey, not very stable ground. Today, the tower is still a part of the town walls, attracting millions of tourists, just like its sister tower from Pisa in Italy. The Town hall is one of the grandest and most majestic buildings of this type in Europe. 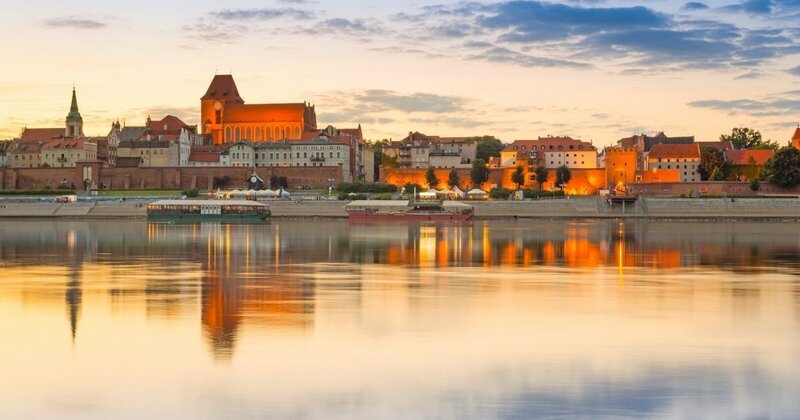 Beyond all doubt, it’s a true pearl of Torun. Erected at the end of the 14th century when the Old Torun enjoyed its greatest splendour. Belongs to the Seven Wonders of Poland. At night, the buildings are lighted up. You can admire their beautiful reflections in the mirror of the Vistula river. On the Kępa Bazarowa Island, there is a special view point. Placed on the premises of the Torun Old Town Market Square. It’s a fountain crowned with a statuette. The monument shows a raftsman playing the violin, surrounded by frogs.